Reach all of your designated treasures and then return to your starting point before the other players. 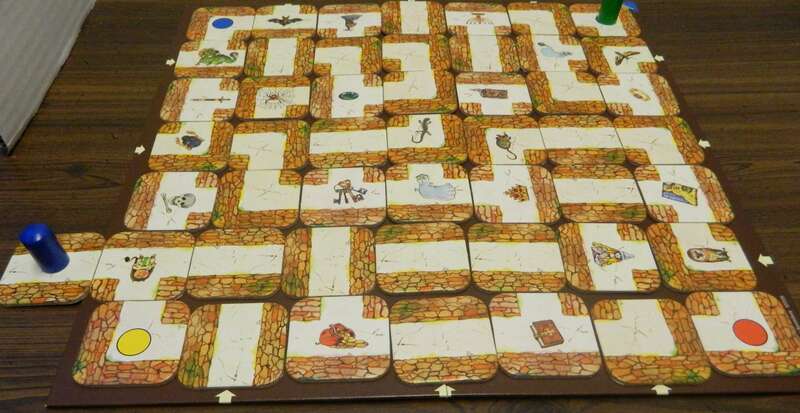 Shuffle all of the maze tiles and randomly place them face up on the gameboard. One maze tile will not be put in the gameboard. Shuffle the treasure cards and deal them out evenly to all of the players. The cards stay in a pile in front of each player with the players being able to look at their top card. Each player chooses a game piece and places it on the corresponding spot on the gameboard. Players choose who will play first and play proceeds in a clockwise manner. During a player’s turn they are trying to move their piece to the spot in the labyrinth that matches the treasure pictured on their top card. A player’s turn consists of two actions. First the player takes the maze card that isn’t currently in the maze. They choose one of the areas with an arrow and push the maze card until a maze card comes out the other end. This maze card will be used by the next player. Players cannot place a maze card in the same spot that it was pushed out of on the previous turn. This prevents players from reversing the move done by the previous player. The player has slid their tile in the middle row on the right side of the gameboard pushing the owl tile out of the labyrinth. The next player will not be able to put the owl tile back into the spot that it was just removed from. If a player’s piece is moved out of the maze, their piece is placed on the maze tile that was just added to the maze. The blue player has been slid off the board. 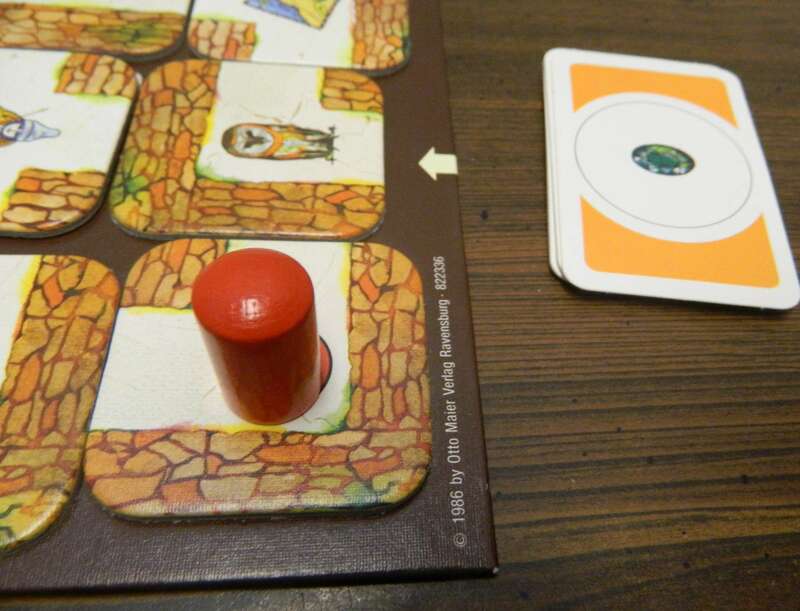 The blue player’s piece would be moved to the owl tile on the other side of the board. After inserting the maze tile, players can move their piece to any space along the open path attached to their current space. Players can choose not to move at all. More than one piece can be on the same space. When a player lands on a space matching their top treasure card, they flip over the card to show they landed on the space. They then look at their next treasure card to see what their next objective is. The red player has added their tile to the gameboard. The red player is then allowed to move. 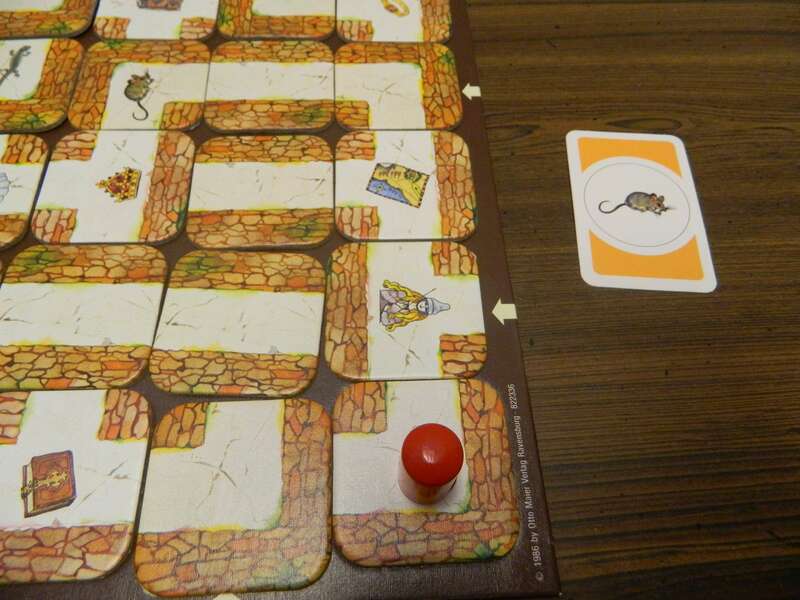 The red player has a clear path to their next treasure (mouse) so they can move their piece to that spot this turn and turn the mouse treasure card face up. After a player has gotten rid of all of their treasure cards, a player needs to move back to their starting place. The first player to turn over all of their treasure cards and make it back to their starting space wins the game. The red player has turned over all of their treasure cards. They then made their way back to their starting spot. The red player has won the game. Ravensburger is not your typical board game company. Ravensburger is more known for their puzzles than for board games and most of their board games would be considered children’s games. 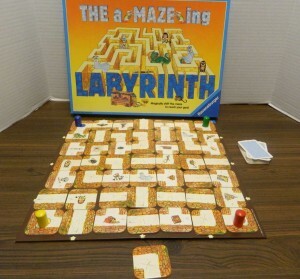 I had heard of Labyrinth quite a while ago since it is one of Ravensburger’s most popular games and was one of the recommended games from the Spiel Des Jahres back in 1986. I never played the game though because I felt that it was just going to be another one of Ravensburger’s children’s games. 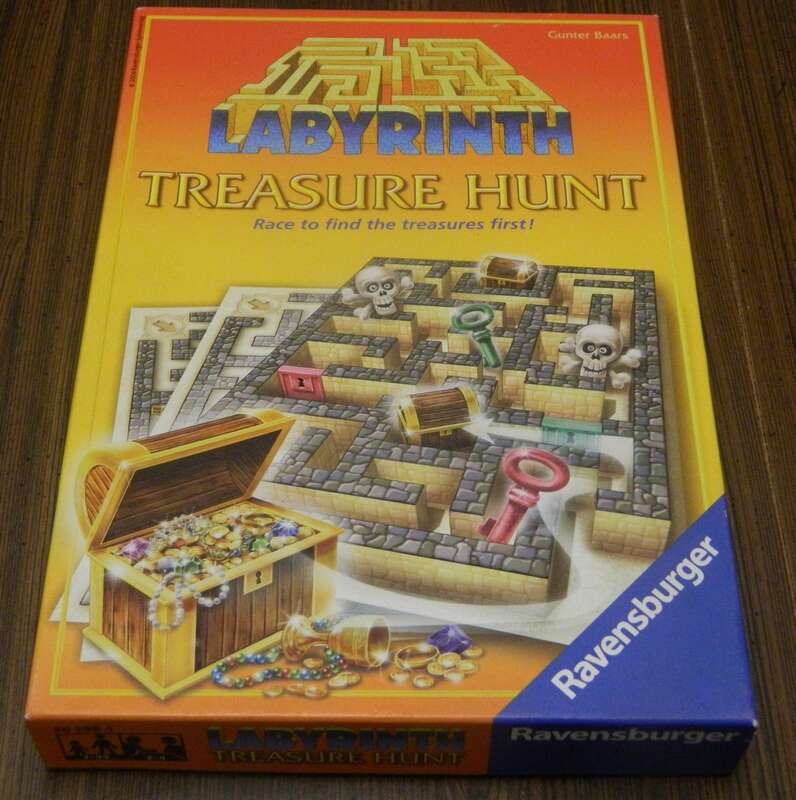 After playing one of the spinoff games, Labyrinth Treasure Hunt, I worried that the original Labyrinth wouldn’t be that great of game. After playing Labyrinth I have to say that I was wrong waiting so long to play the game since Labyrinth is a good/great game that has one flaw that keeps it from being even better. My main concern with Labyrinth was that it would be too simple for adults since it is a family game after all. 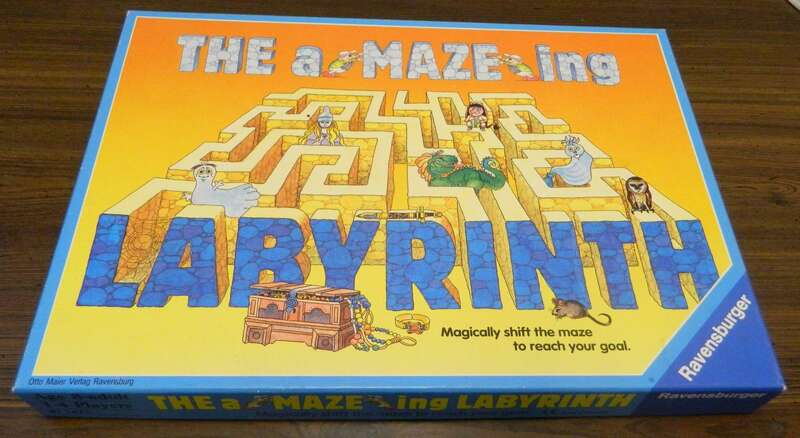 The game is very simple since all you do is slide a tile and then move your piece around the labyrinth. The rules are easy to explain to new gamers as well as experienced gamers. This makes the game simple enough that younger children should understand the game and still enjoy it. The main reason why I was quite surprised by Labyrinth was that the game has a lot more strategy to it than you would expect. I like games that are simple enough that it is easy to teach to new players but still have enough strategy for players that like to control their own fate in a game. Labyrinth is the type of game that you could appeal to both casual gamers and more strategy minded gamers at the same time. Most of the strategy in the game comes from having to plan ahead and look through all of your options in order to make your way through the labyrinth. You might think that it is hard to reach your next treasure but sliding just one tile could change the tiles enough to create a long path that lets you move to the other side of the labyrinth. The fact that there are so many ways you can manipulate the labyrinth allows players to significantly impact the game with every tile that is placed. To really excel in the game you really need to think more than one turn into the future though. You don’t know what the other players are going to do on their turn but you need to plan ahead in order to create paths to reach some of the treasures. I don’t mind occasional luck in a game but I appreciate when players have the ability to impact their own fate in the game. The reason that I think Labyrinth works so well is that the mechanics are so simple. You would think pushing tiles through the labyrinth wouldn’t be that easy but you just insert the tile on one end and just push the tile off the other end. It is a lot easier to figure out how a tile placement affects the labyrinth than you would expect. This is key because the game would have suffered if it was hard to figure out how a particular move would affect the rest of the labyrinth. By the very nature of the game no two games of Labyrinth are likely to be the same either so you can get quite a bit of replay value out of the game. Since the board is randomly assembled for each game and the board is changing every turn, you are always going to have to adjust your strategy. Shifting just one row or column of tiles can drastically change the entire labyrinth so you will always need to be on your toes as you try to navigate the labyrinth. I have to give Labyrinth a lot of credit since the components are well designed. 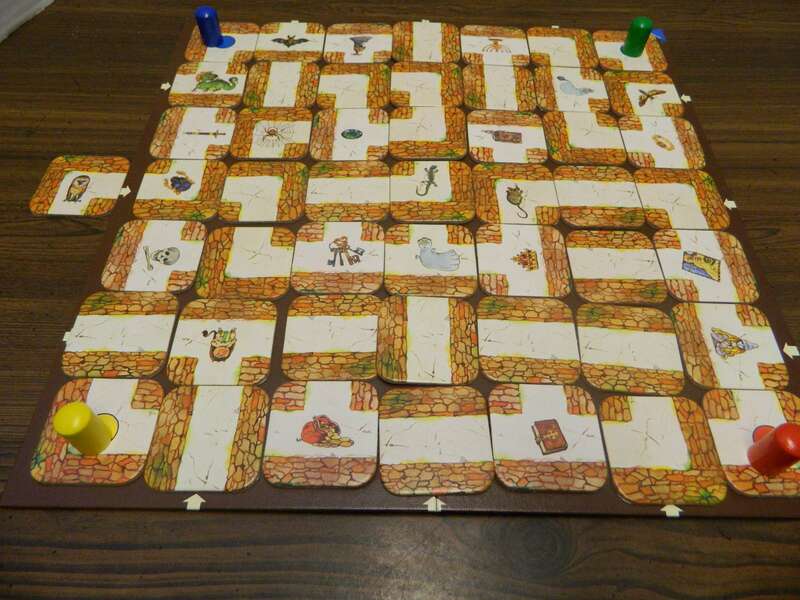 The gameboard works really well since it is really easy to slide tiles through the labyrinth. All of the pieces are made of thick cardboard so they are durable. While the artwork isn’t the best I have ever seen, the artwork is still quite good. By far the worst thing about Labyrinth is the end game. When all of the players are trying to find their treasures the game runs smoothly as everyone is mostly focused on helping themselves rather than messing with the other players. When one player flips over their final treasure card though the game changes drastically. Players switch from trying to get to their own treasures and instead try to prevent the other player from reaching their finish spot. In a four player game you will have three players working against one so it is very hard for a player to actually reach their finish spot. In the game I played it actually took more time to get to the finish space after reaching the final treasure than the rest of the game combined. At the end of the game two players had gotten all of their treasure cards while two players had a treasure card yet to get. Since no one would let one of the other players win the game a situation developed where two players ended up hindering one of the players while the other two players hindered the other player. This meant that it was next to impossible for any player to ever reach the finish spot. The end game causes so many problems that I wish you could remove it from the game entirely. The problem with removing it is that the game would be too easy/quick not having to get back to your own finish line. The game would probably only last around fifteen minutes if you removed the requirement of getting back to your finish space. The problem is if you keep the requirement in you are going to waste a bunch of time as two or more players compete in a game of tug of war as they are trying to mess with one another. If you get rid of the end game though, the game is too short and easy and luck has a bigger impact on who wins the game. The game is set up in a way where it is easy to gang up on a player. It is pretty easy to get a player stuck on an island where they have no options for movement. If the other players work together there is a good chance that you have no chance to make your way out of your predicament. When playing the game with children this isn’t going to be as big of a problem since they are likely going to focus more on their own goal instead of messing with the other players. A game with just adults though can get really cutthroat though because competitive players will look for any possible play that will prevent another player from winning the game. This brings up the analysis paralysis issue in Labyrinth. There is quite a bit to think about in a given turn. You have quite a few options on where you can place a tile. You then have to figure out how each placement will affect the other tiles in the game. If you are playing with a player that must always find the best possible move you are going to have to waste quite a bit of time just sitting around waiting for the other players. The last issue I had with the game is that the game has quite a bit of strategy but still relies on card draw luck. The treasure cards you end up drawing can have a big impact on your fate in the game. A player can get a bunch of treasure cards that are near one another which makes it easy to gather a bunch of treasures quickly. Other players could get stuck with treasures that are on opposite sides of the board. It is a pain having to move back and forth through the gameboard. The treasure tiles in the middle of the gameboard seem to be much harder to reach as well since these tiles are fixed to the gameboard so they can’t be turned and you need to set up quite a few tiles in order to reach them. Labyrinth surprised me quite a bit. I thought it was going to be a solid game but it is actually a pretty good game. The game is simple enough for children to play but also has enough strategy which makes the game appeal to adults as well as children. The game is simple but the mechanics work so well. While the game has a decent amount of luck, you need to think and plan ahead in order to do well in the game. The only big problem with the game is that the end game takes way too long. If you are looking for a children’s/family game that is still fun for adults, I think Labyrinth is a good game that you should look into. If you like light to moderate strategy games you should enjoy Labyrinth. If the game’s concept doesn’t really appeal to you though I would probably recommend passing on Labyrinth. How about creating a rule that, once a player finds all 3 treasures, they are now able to replace the tile that another player removes on their turn. That way, the other players may focus more on their game, instead of defense. Maybe the only exception is if the player’s piece is on the tile that was removed. That sounds like an interesting house rule. I might have to try it the next time I play Labyrinth. Therefore if you play as intended, the “cons” section is mostly irrelevant. As for children…if you want to be humiliated get a couple of 7/8/9 year olds on it. They want to look at your card so they can “help” as they have genuinely become sorry for you, as when 30 seconds are up they just assume you have forgotten it is your turn, not that you are thinking! I either must have missed that statement in the rules or it could have been something that was changed in later versions of the game (as my copy of the game is one of the older versions of the game). Either way I totally agree with the rule you stated as it would improve the game. We were given this game, so it seemed like something was not right. I found your site in my search. You state that there are 34 maze cards in the game. Then why does your example set-up show 49 +1?? I have 34 maze cards and I do not have all the items that the treasure cards show. is that intentional? I have not played Labyrinth in quite some time so this is based on what I remember from the game. I am pretty sure that some of the tiles are attached/glued directly to the board (which weren’t counted in the total in the contents section) and can’t be removed. I think the designers did this to limit which rows and columns you could slide. If I remember correctly I think every other row and column has a tile attached to the edges of the board to prevent you from moving that row or column. There were also a couple tiles attached to the middle of the board. If I remember correctly I think some of these tiles had some of the treasure items on them so that could explain why some of the items in your copy are missing. Does your copy of the game have any tiles directly attached to the gameboard? A simple game that has a surprising amount of strategy to it. An overall well designed game that is fun for all ages. The game tends to stall significantly once one player has gotten all of their treasure cards. Players can get lucky and have all of their treasure cards in easy to get to places.